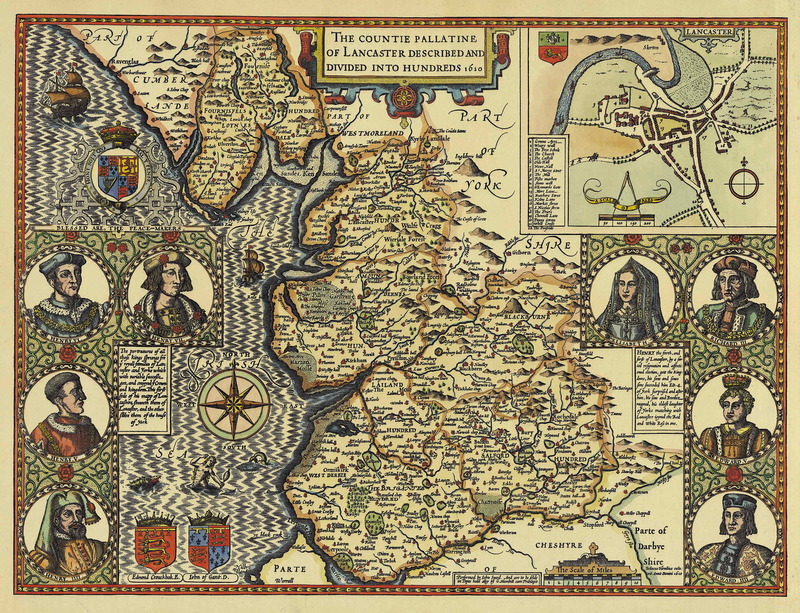 We currently have 8 full county maps of Lancashire for online viewing. 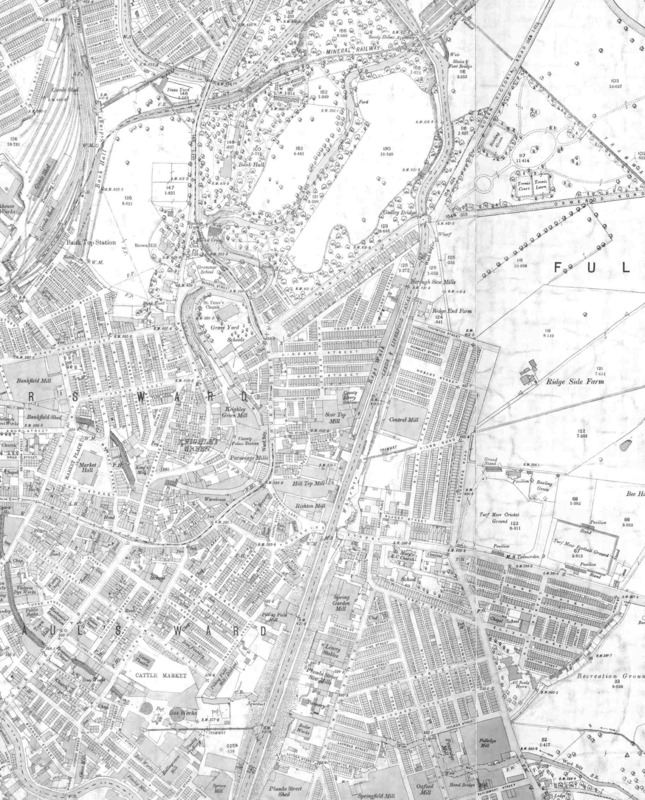 In addition we now have several town maps c.1890 based on the 1:2500 OS first editions and some based on the 1:10,560 first editions of 1845, plus one Tithe Map. 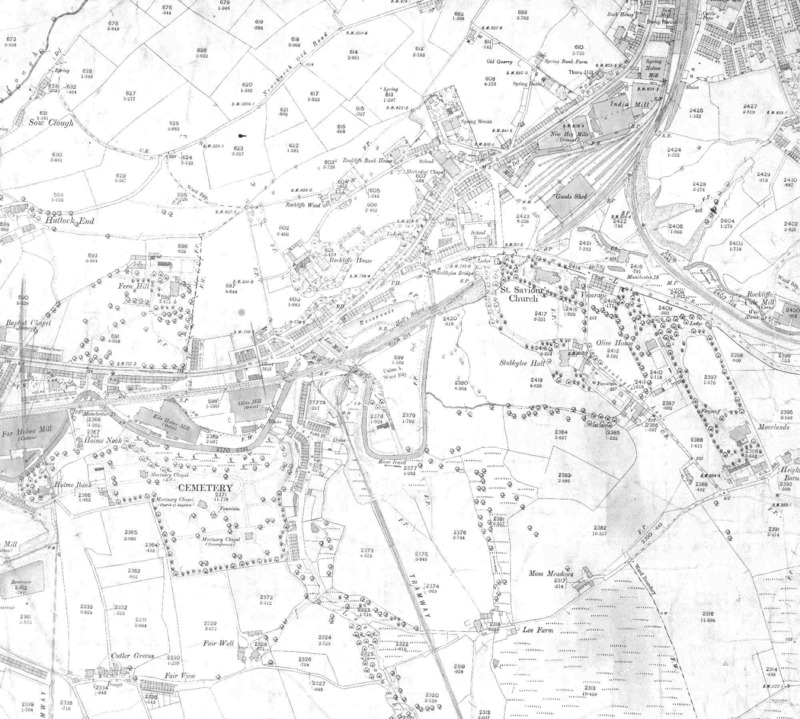 If you are interested in locating old Parishes then the OS Index of early editons map is probably the best place to start. Many of the original paper maps from which these digital versions were scanned are held in the Historic Environment Office. 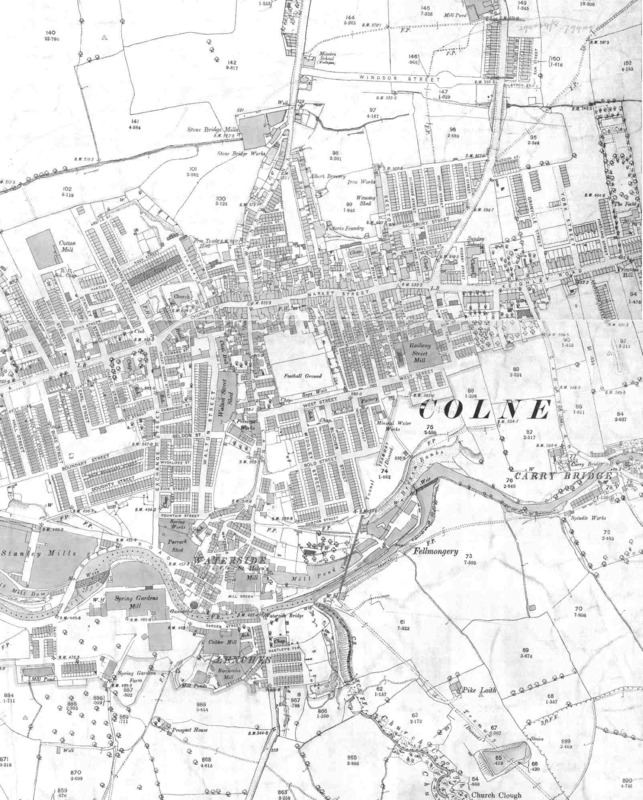 Mario, our Geographic Information System (GIS) includes historic maps of more of Lancashire at scales of 1:10,600 (c.1845) and 1:2500 (c.1890) for several towns. Modern aerial photographs are also available for all of Lancashire. Because of internet limitations the map area is smaller than the maps here but if you are interested in an area not covered here then it is definitely the place to try. Note: In 1974 the administrative boundaries of Lancashire were redrawn and the Counties of Greater Manchester and Merseyside formed. Apart from the whole county maps we have no detailed maps of those areas. 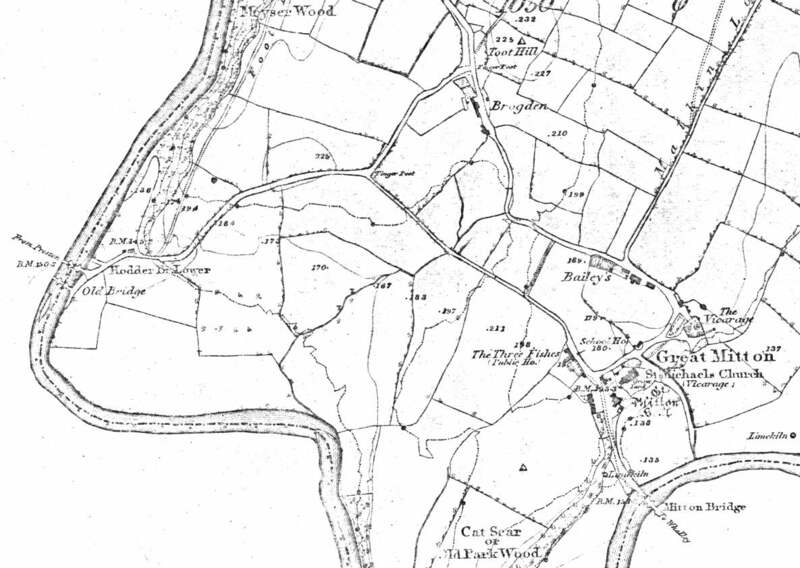 John Speed's map of Lancashire is one of the earliest and shows towns and villages but no highways. 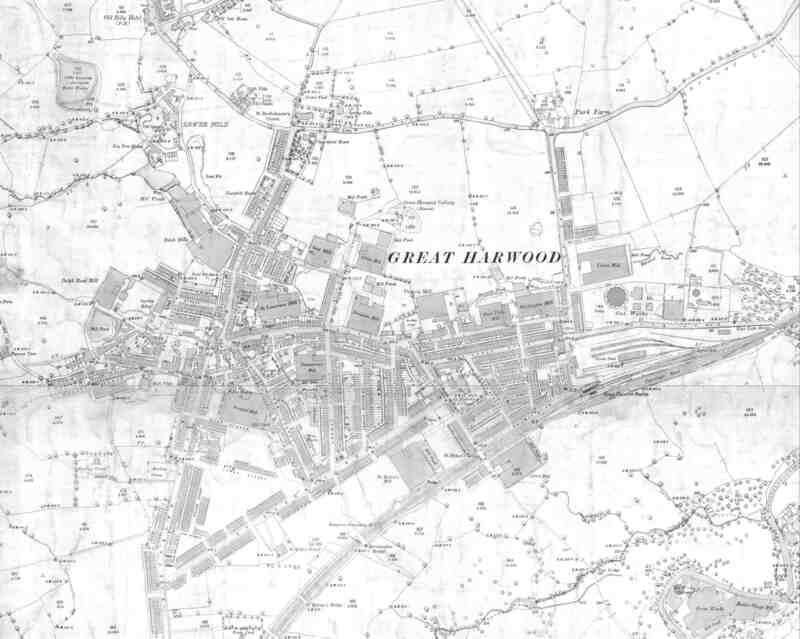 Greenwood, 1818 - Colour map and probably our best! The 6 hundreds are believed to originate before the Domesday Book and the formation of Lancashire itself! 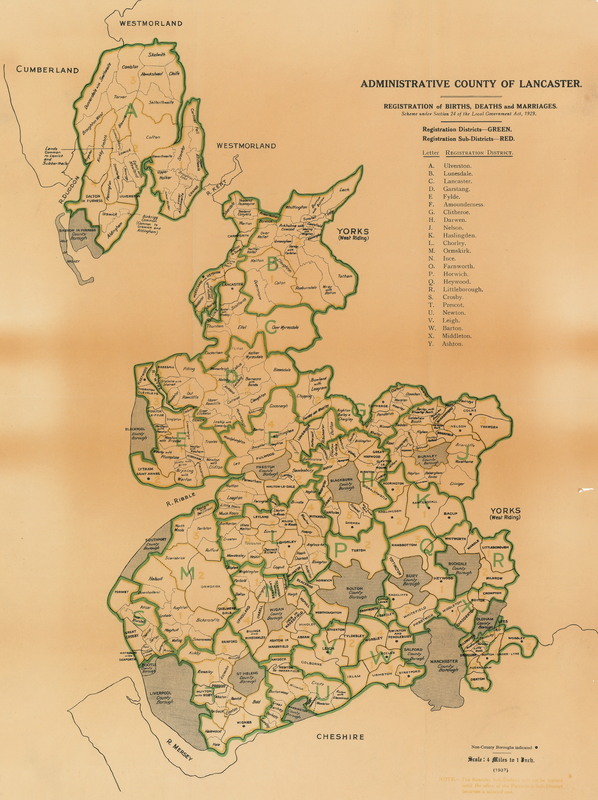 Map of Lancashire dated 1937 and featuring the then parishes with the areas for the Registration of Births, Marriages and Deaths . 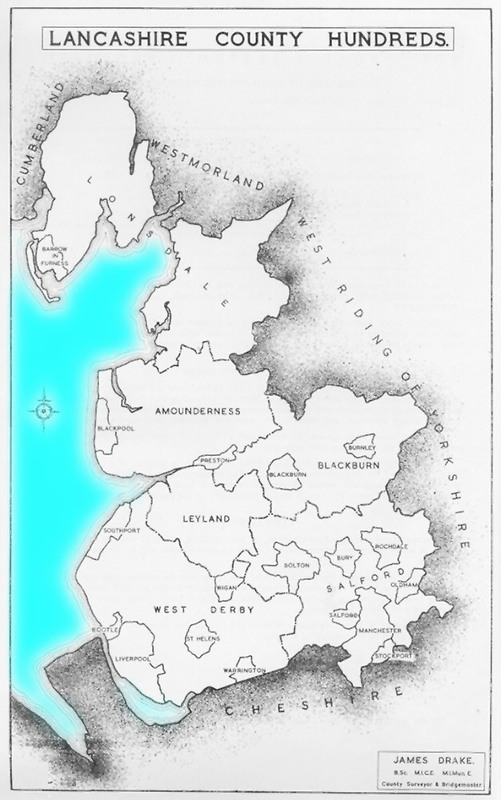 This shows the county boundary as it was between 1888 and 1974. File size = 1.4Mb. Appley Br. 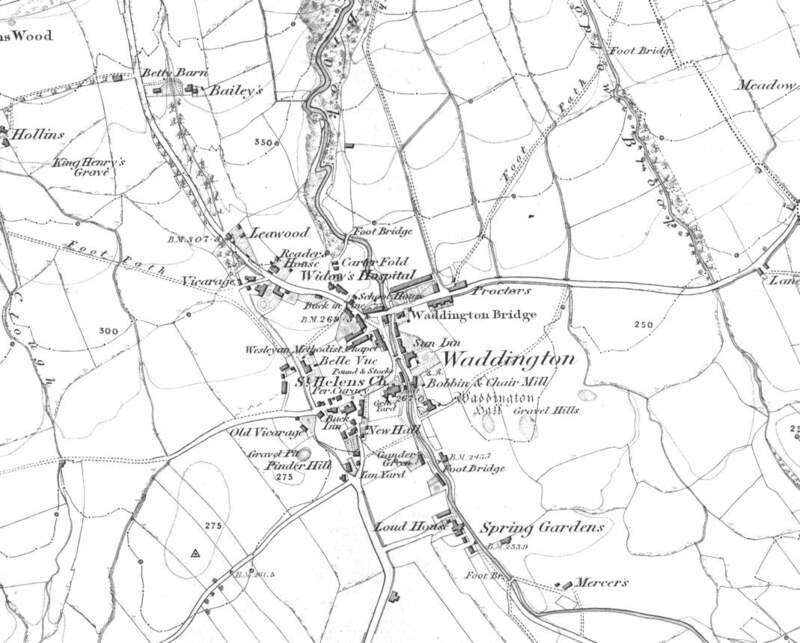 and Wrightington - This first edition OS 6-inch map of the Appley Bridge and Wrightington area was published c.1845. Can you spot Noah's Ark? 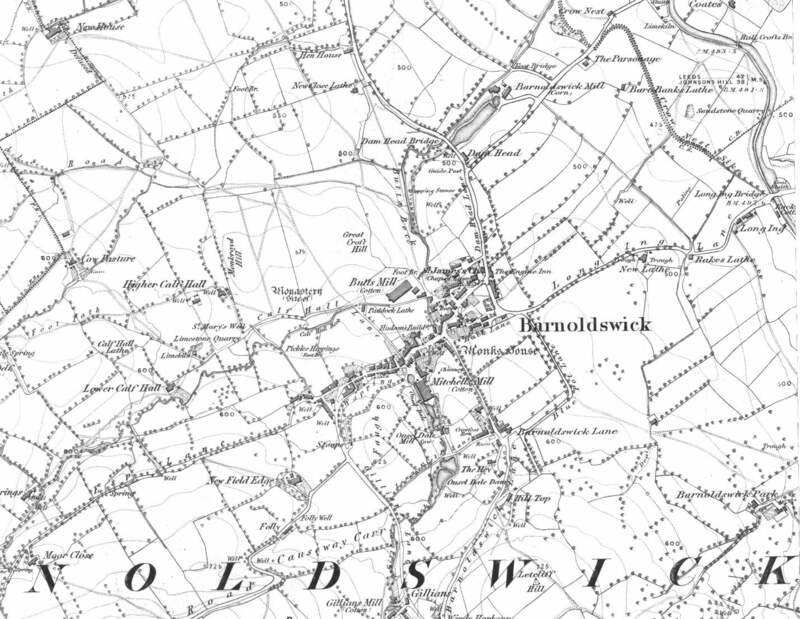 Barnoldswick - This first edition OS 6-inch map (revised) of Barnoldwick is from the Yorkshire Series as Barnoldswick was then in Yorkshire. 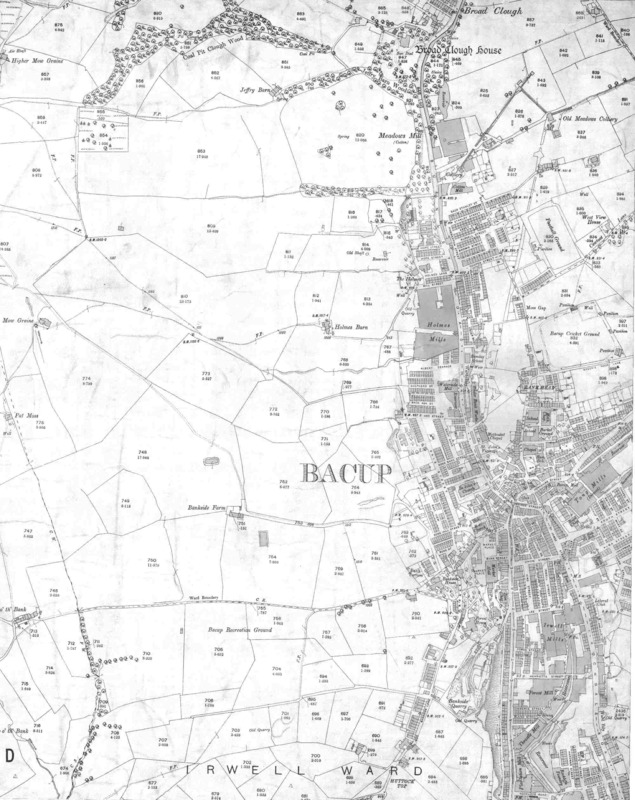 Barrowford - This first edition OS 6-inch map of the Barrowford area was published c.1845. 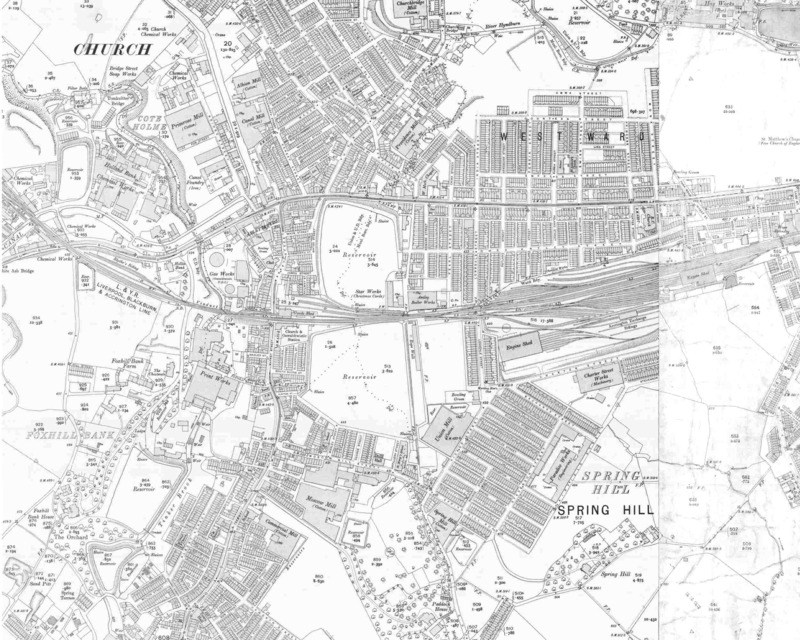 Brierfield - This first edition OS 6-inch map of Brierfield was published c.1845. 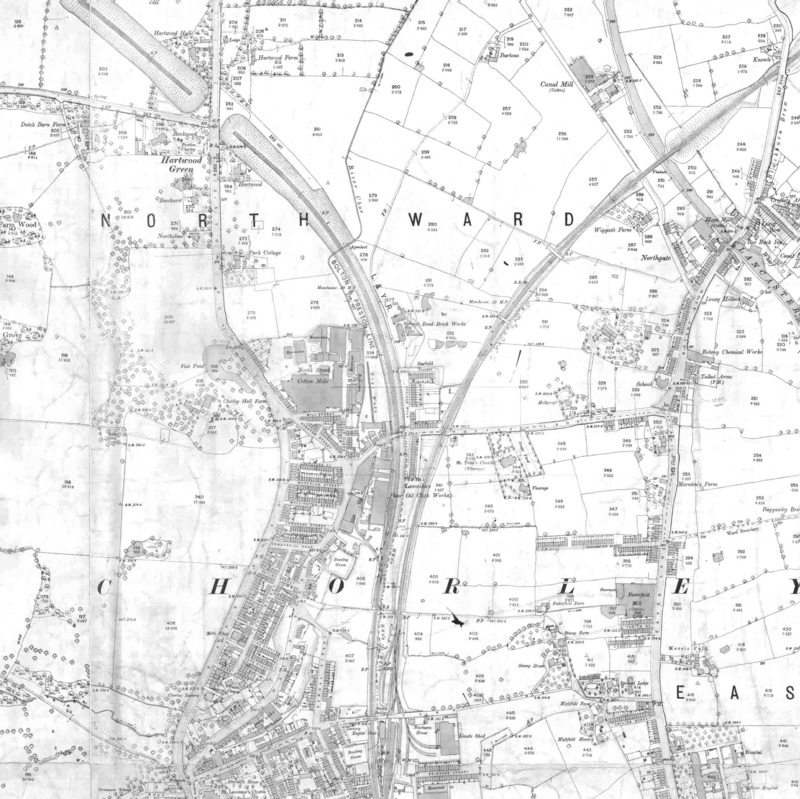 Burscough/Burscough Bridge - This first edition OS 6-inch map of the Burscough/Burscough Bridge area was published c.1845. 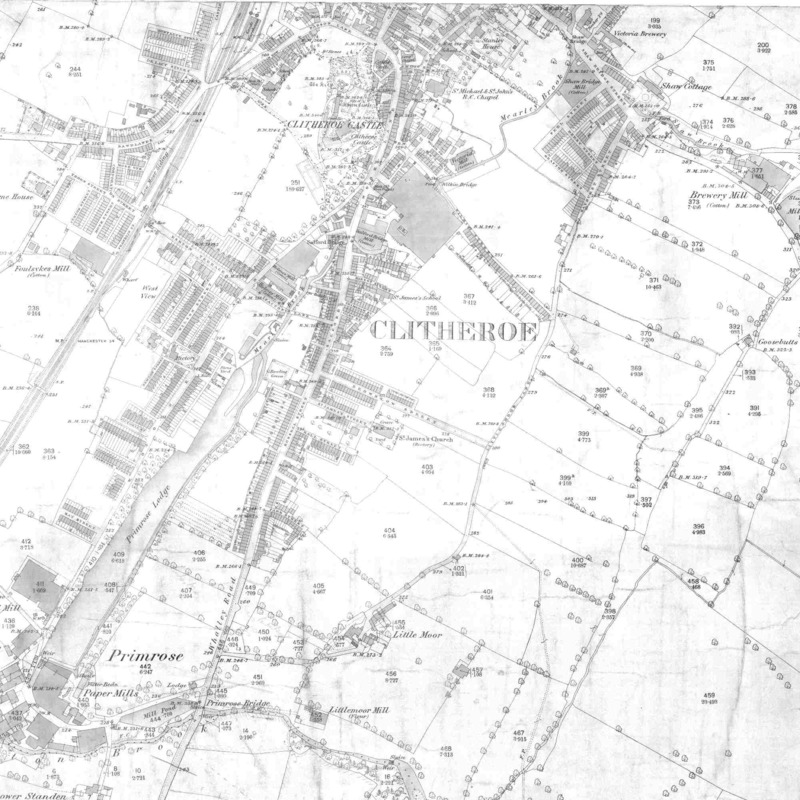 Clayton-le-Moors - This first edition OS 6-inch map of the Clayton-le-Moors area was published c.1845. 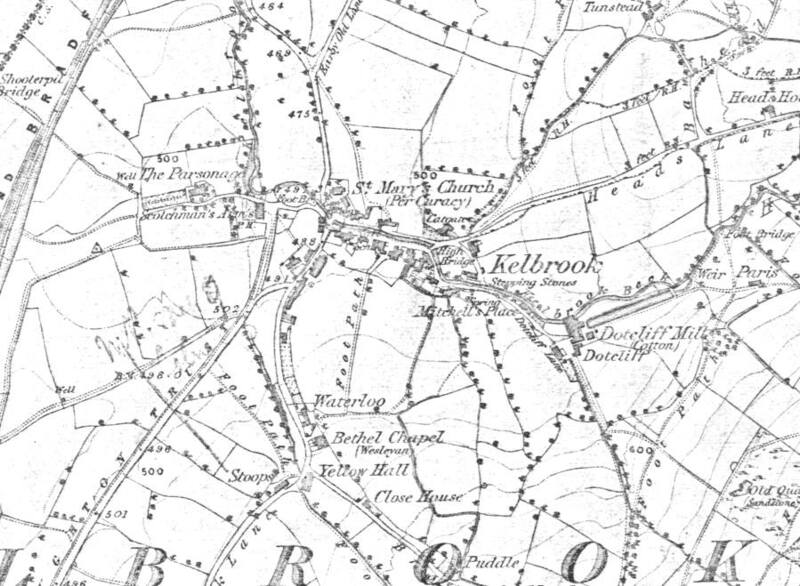 Eccleston and Eccleston Green - This first edition OS 6-inch map of the Eccleston area was published c.1845. 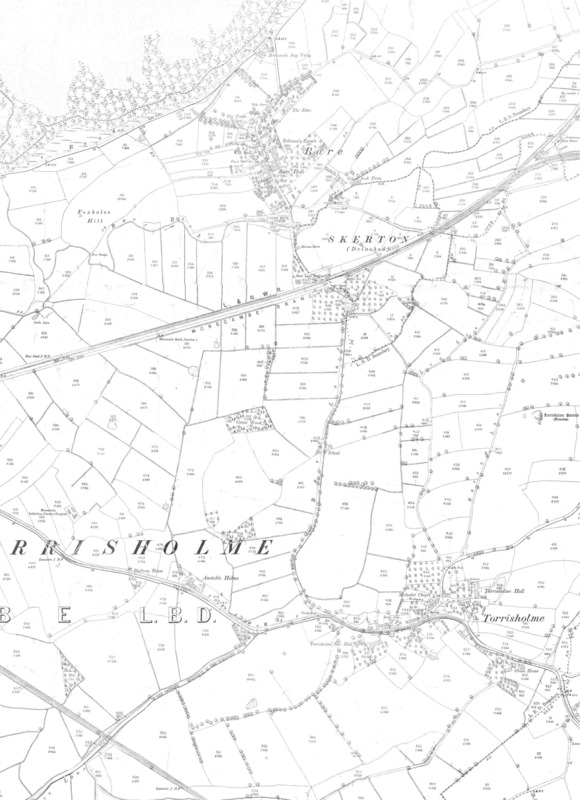 Croston - This first edition OS 6-inch map of the Croston area was published c.1845. 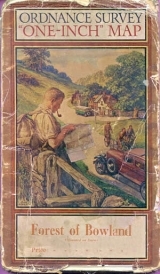 Earby - This first edition OS 6-inch map (revised) of Earby is from the Yorkshire Series as Earby was then in Yorkshire. 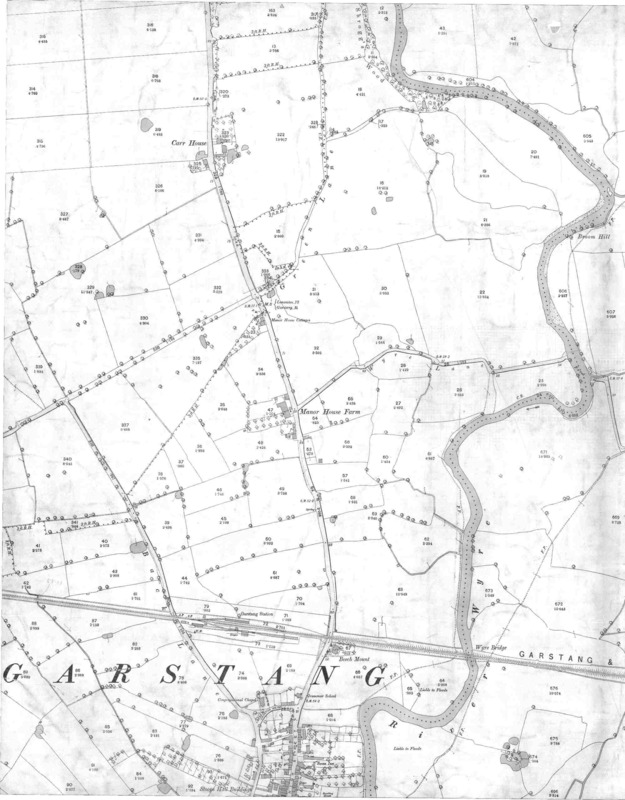 Lancaster - This first edition OS 6-inch map of the Lancaster area was published c.1845. Note the position of Lancaster station. 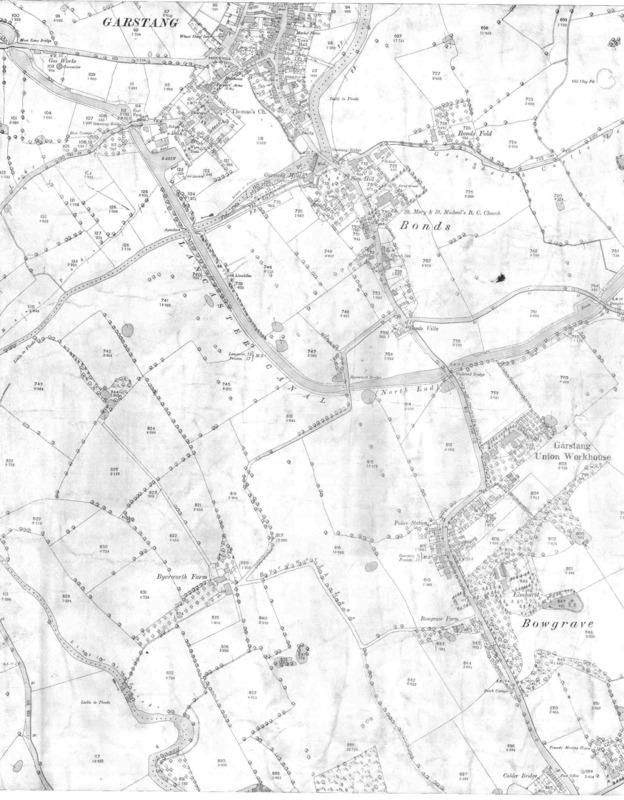 Longridge - This first edition OS 6-inch map of the Longridge area was published c.1845. 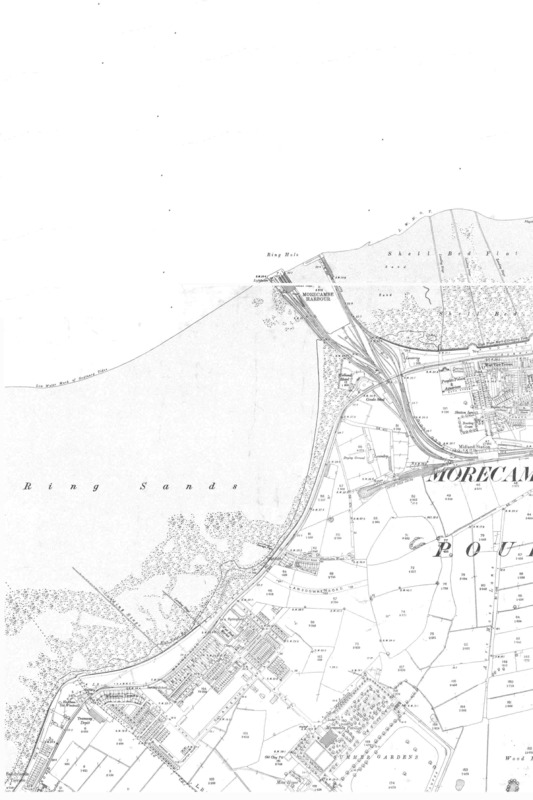 Lytham - This first edition OS 6-inch map of Lytham was published c.1845. 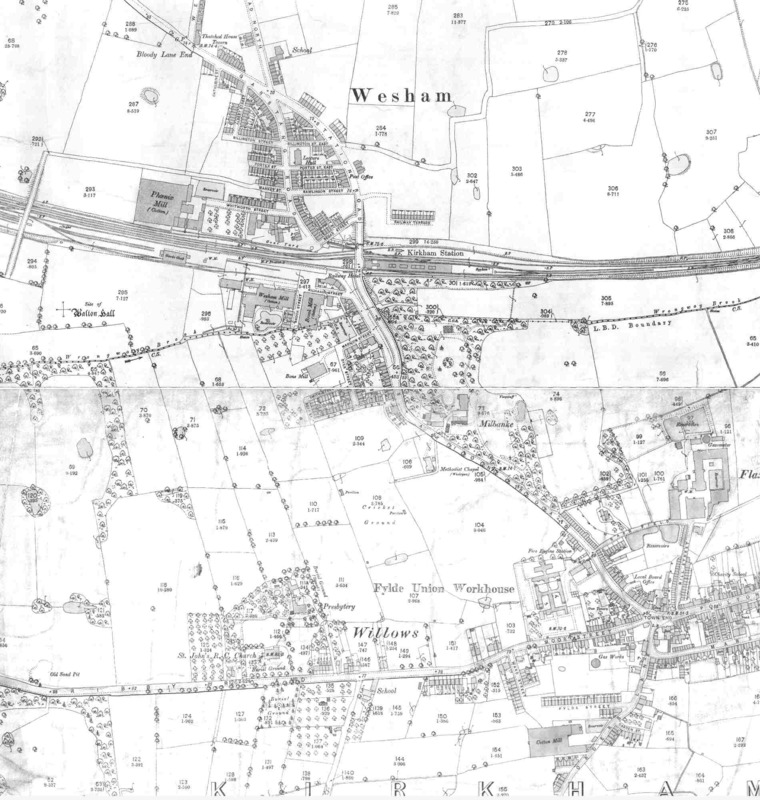 Padiham - This first edition OS 6-inch map of Padiham was published c.1845. Parbold and Newburgh - This first edition OS 6-inch map of the Newburgh and Parbold area was published c.1845. Preston (PDF Format, 3.41 Mb) - Published 1852. DDX 827/1. 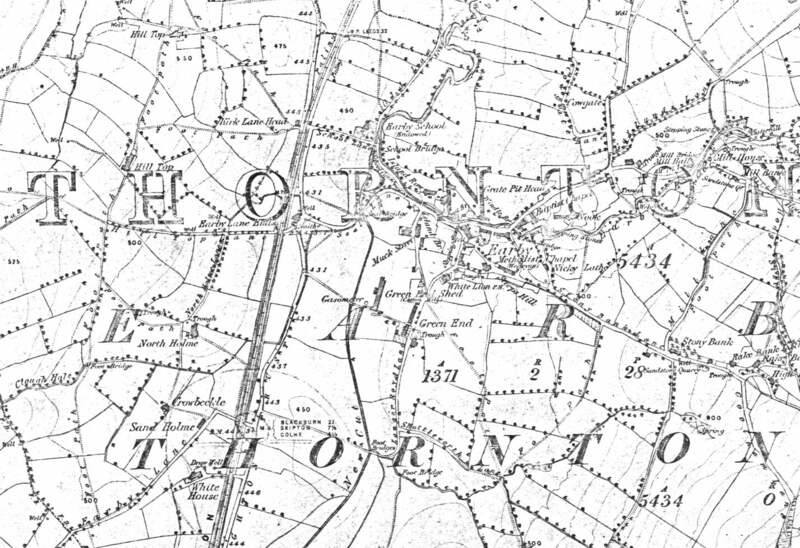 Rishton - This first edition OS 6-inch map of Rishton was published c.1845. 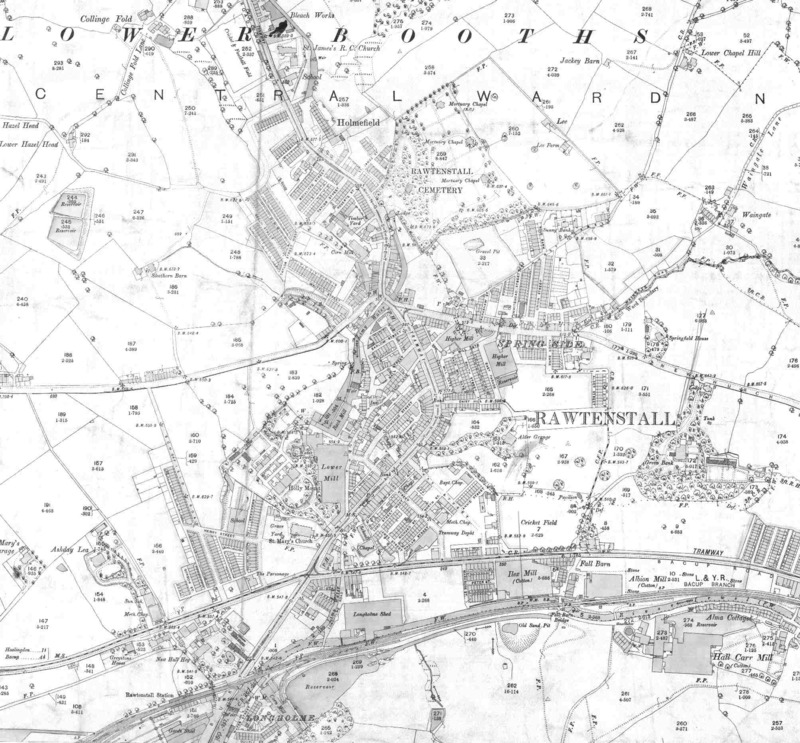 Skelmersdale - This first edition OS 6-inch map of the Skelmersdale area was published c.1845 but linking with today's town is tricky. Ashurst's Beacon and the River Tawd provides a link! 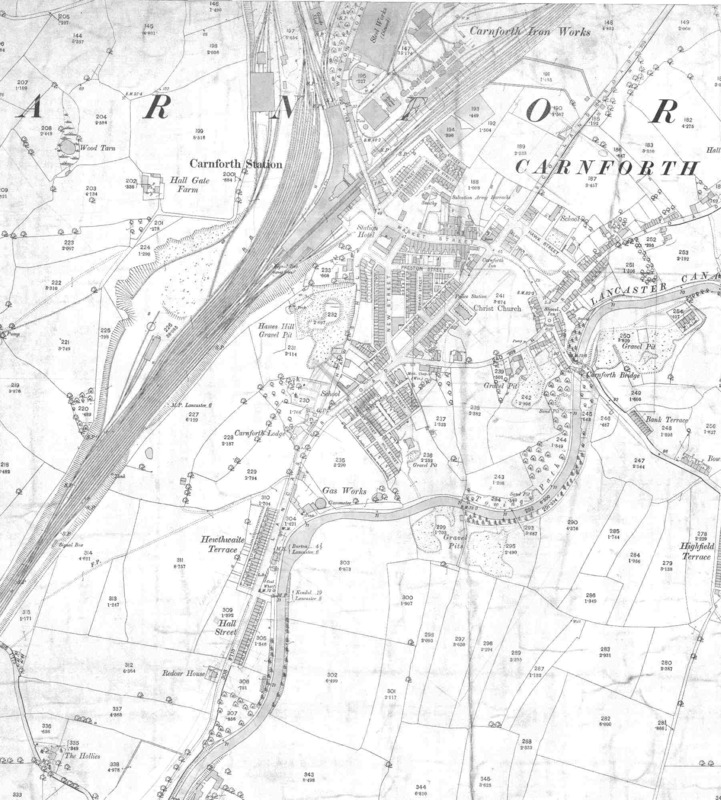 Carnforth - This old map of Carnforth is from the first Edition OS 1:2500 map of c.1890. There is only one tile but it includes the famous station. 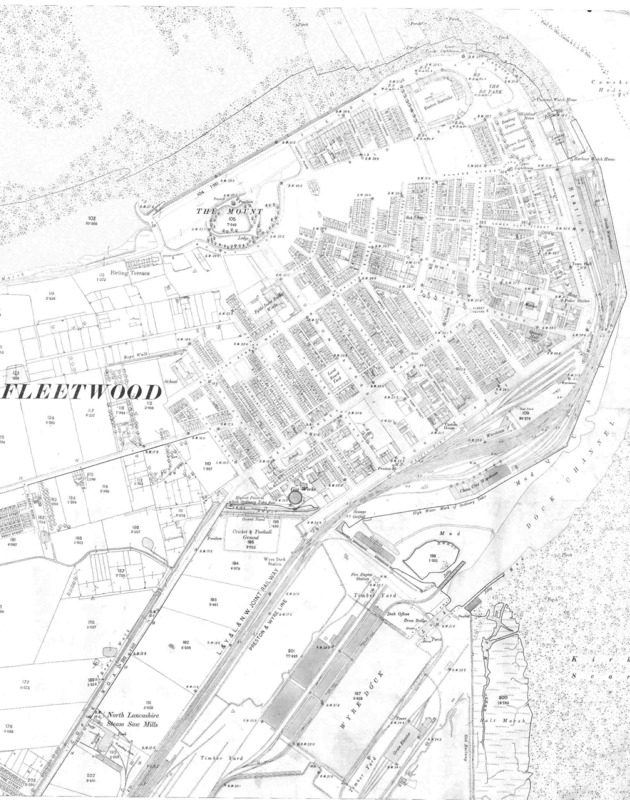 Fleetwood - This old map of Fleetwood is from the first Edition OS 1:2500 map of c.1890. 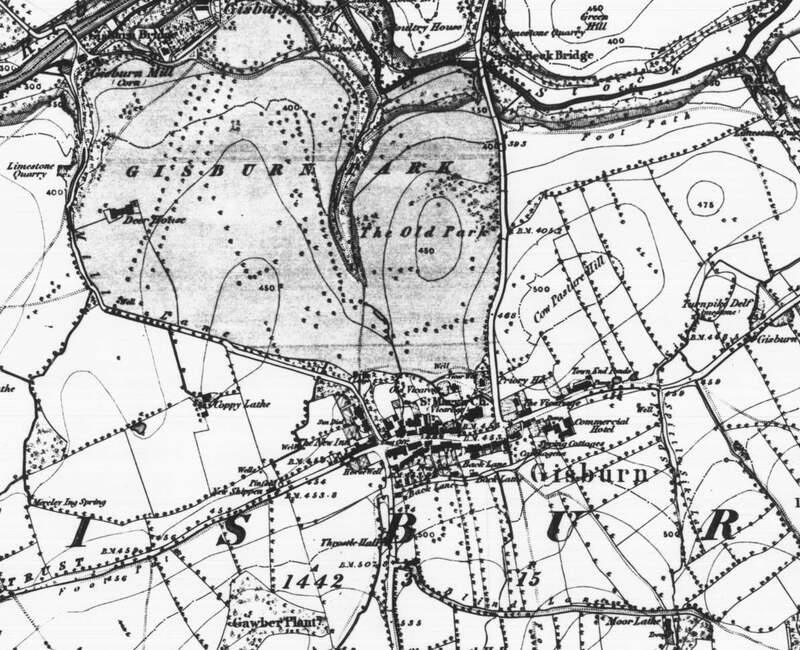 Great Harwood - This old map of Great Harwood is from the first Edition OS 1:2500 map of c.1890. It includes the railway station. 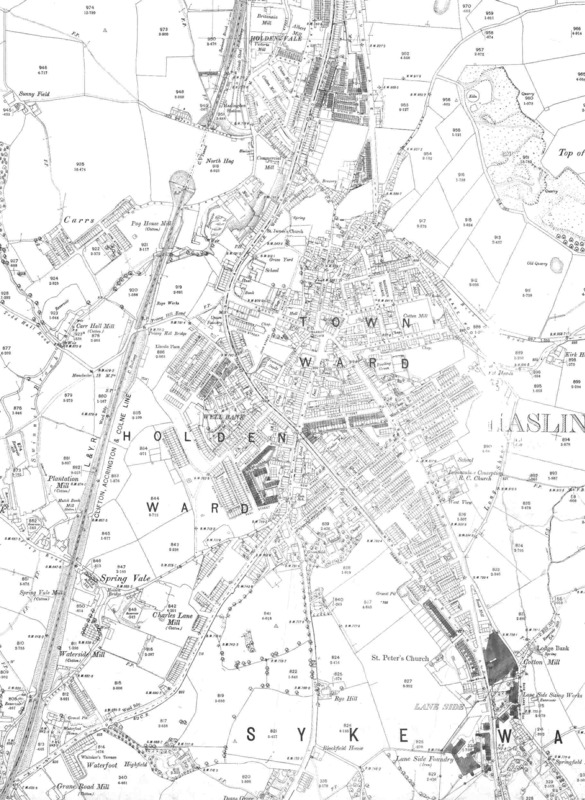 Haslingden - This old map of Haslingden is from the first Edition OS 1:2500 map of c.1890. 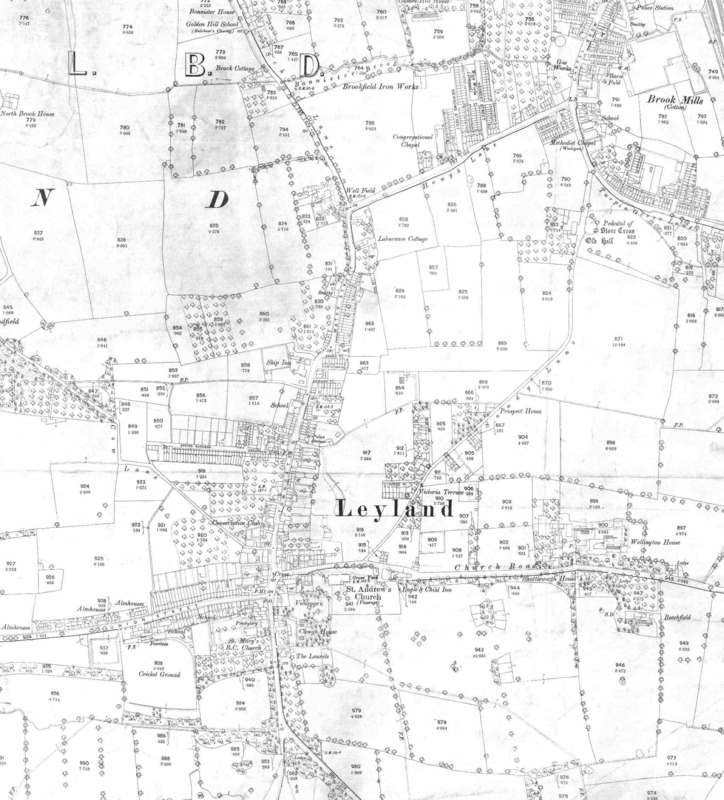 Leyland - This old map of Leyland is from the first Edition OS 1:2500 map of c.1890. Nelson - This old map of Nelson is from the first Edition OS 1:2500 map of c.1890. 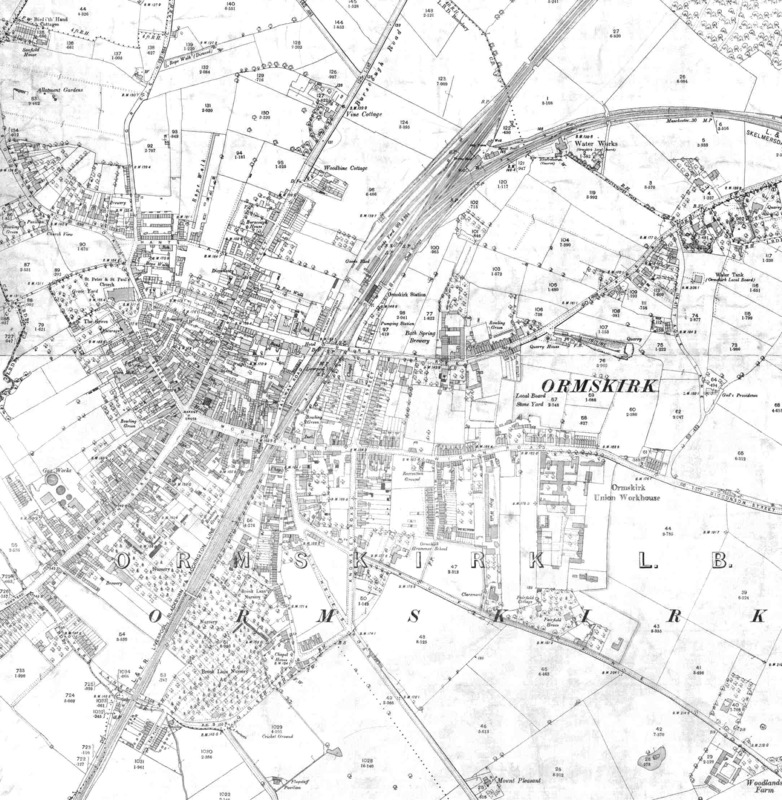 Ormskirk - This old map of Ormskirk is from the first Edition OS 1:2500 map of c.1890. 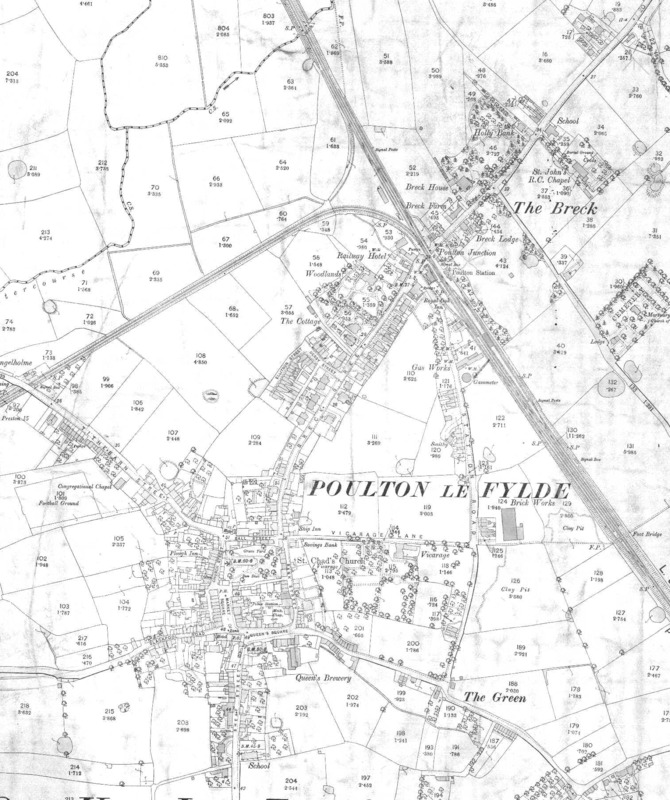 Poulton-le-Fylde - This old map of Poulton is from the first Edition OS 1:2500 map of c.1890. 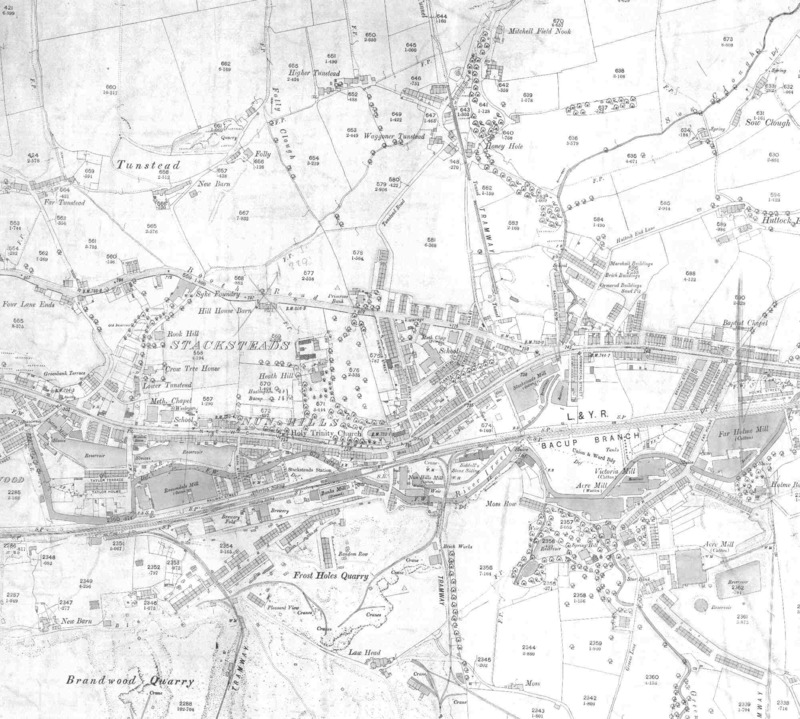 Rawtenstall - This old map of Rawtenstall is from the first Edition OS 1:2500 map of c.1890. 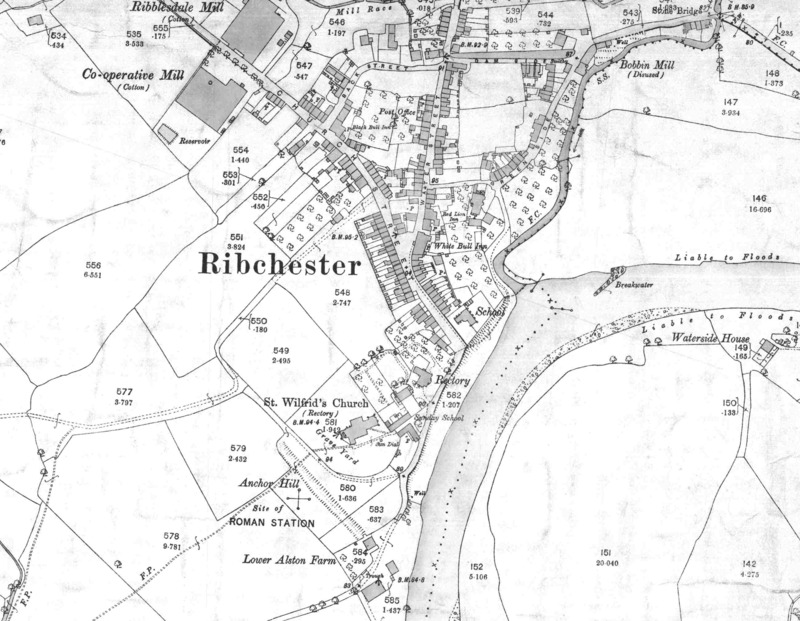 Ribchester - This old map of Ribchester is from the first Edition OS 1:2500 map of c.1890. There is only one tile but it includes the Roman Fort. Note this map is at twice our normal scale. 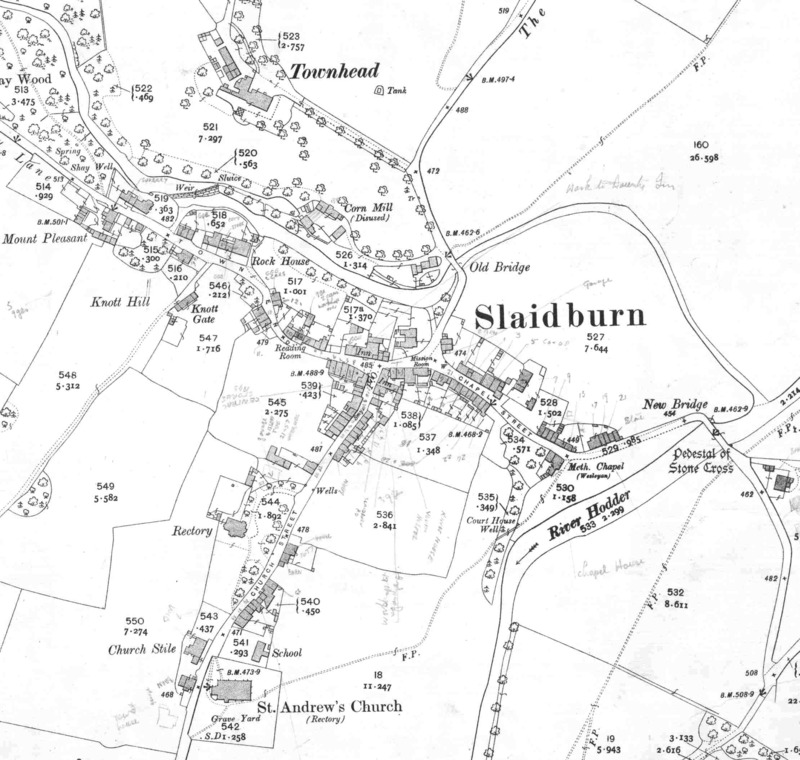 Slaidburn - This old map of Slaidburn is from the first Edition OS 1:2500 map of c.1890. There is only one tile but it is twice our normal scale and includes some handwritten property names and numbers! 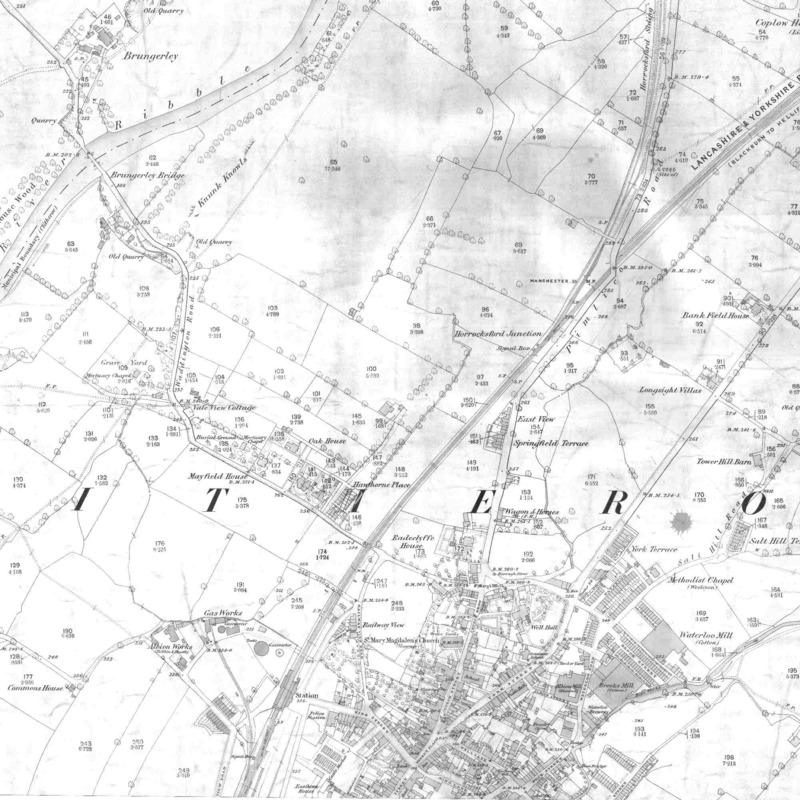 Waterfoot - This old map of Waterfoot is from the first Edition OS 1:2500 map of c.1890. The railway and Thrutch Tunnel feature. 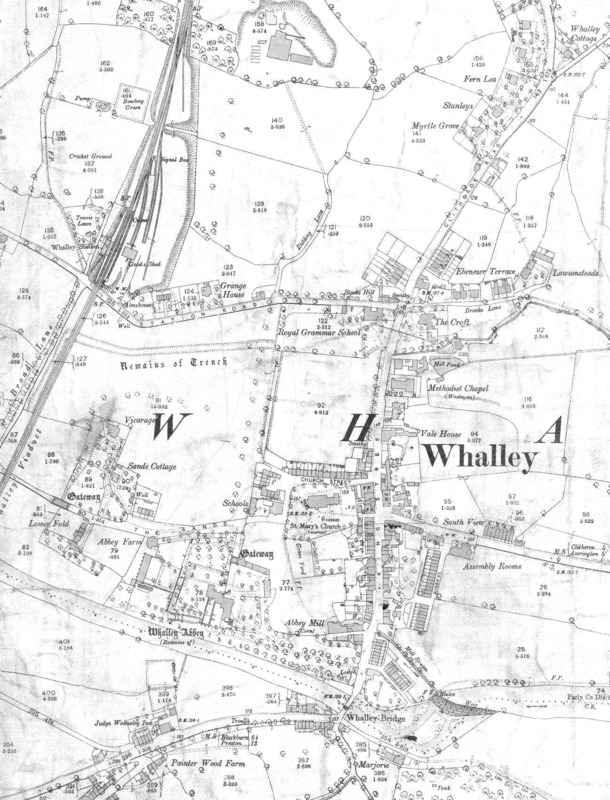 Whalley - This old map of Whalley is from the first Edition OS 1:2500 map of c.1890. There is only one tile but it includes the Abbey. 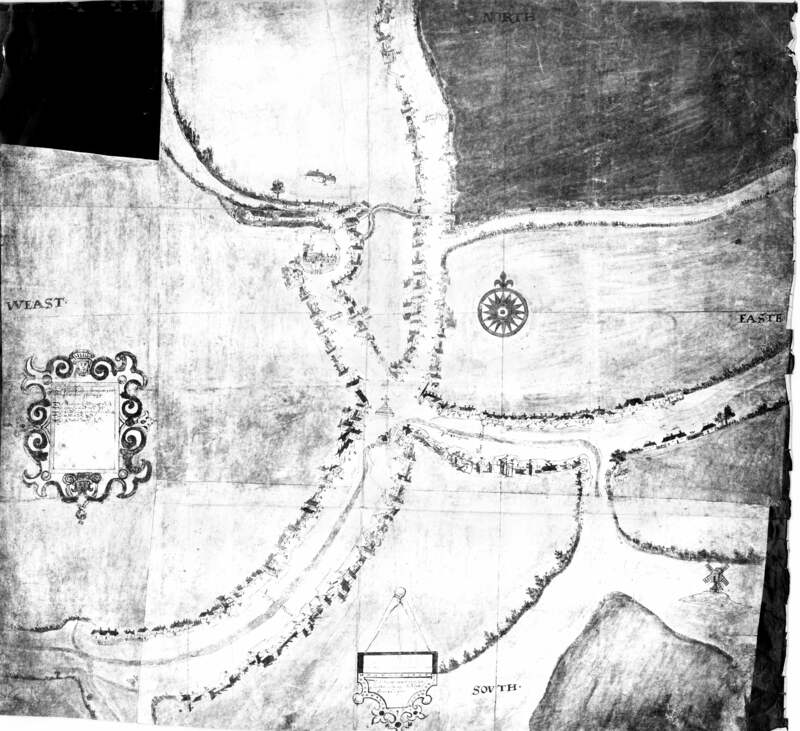 Ogilby's Road Map 1675 - Road Map by John Ogilby, 1675. The Road from London to Carlisle (Garstang to Carlisle Section). This map, engraved in strip form, gives details of the roads and terrain crossed including rivers, mountains, towns, and bridges. This "strip map" was part of John Ogilby's Britannia, which consisted of 100 road maps of England and Wales. 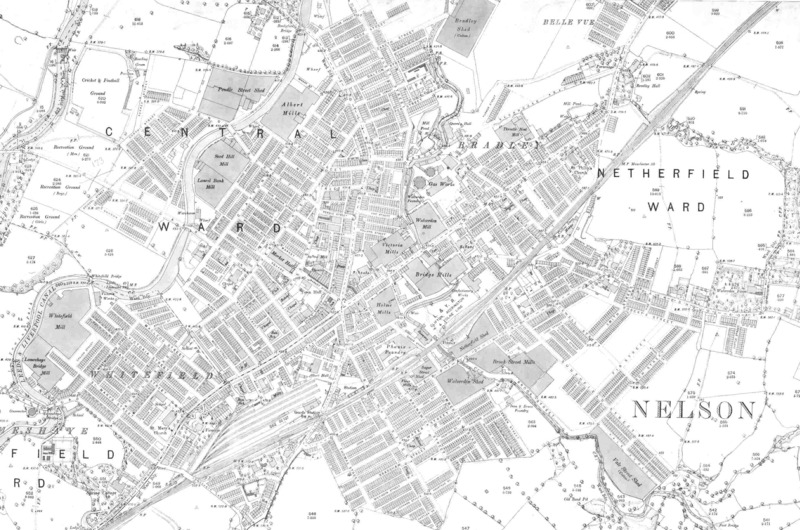 Preston 1715 - This map dates from the Jacobite rebellion of 1715. The battle in Preston was the only one in England, and resulted in the Scottish forces (who had linked up with local Catholic/Jacobite supporters) getting thrashed by the Hanoverians. Many were executed or transported in the aftermath of the Rebellion. 30 years later Bonny Prince Charlie had another go, and got even less support south of the border (and also south of the Highland fault, it has to be said). The map from which this image was scanned is available for inspection in the Lancashire Record Office - reference DDPR 141/1. 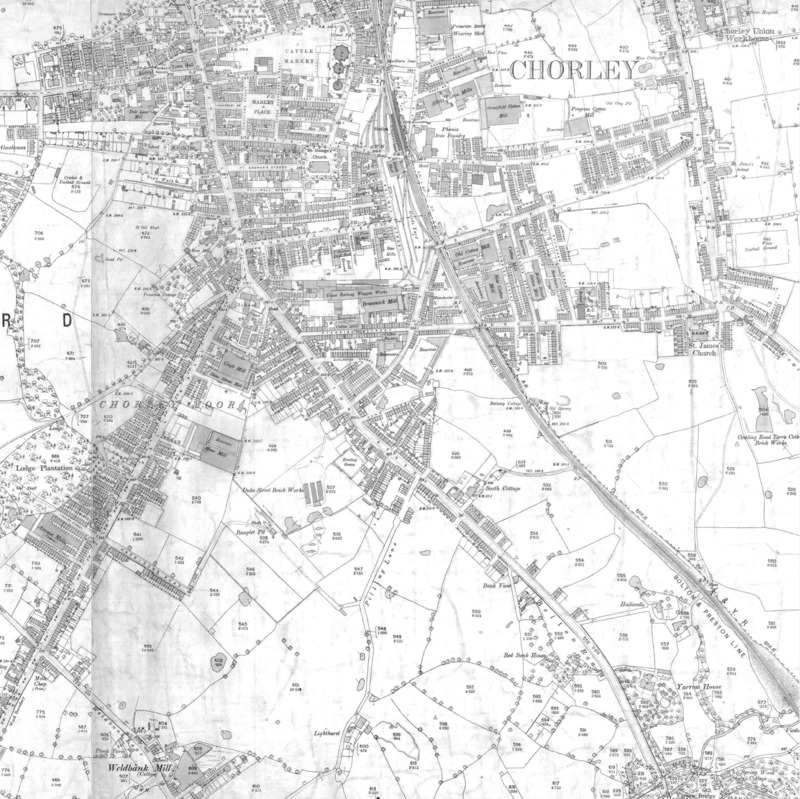 Chorley 1769 - Chorley over 230 years ago. Note the open streams across Market Street! 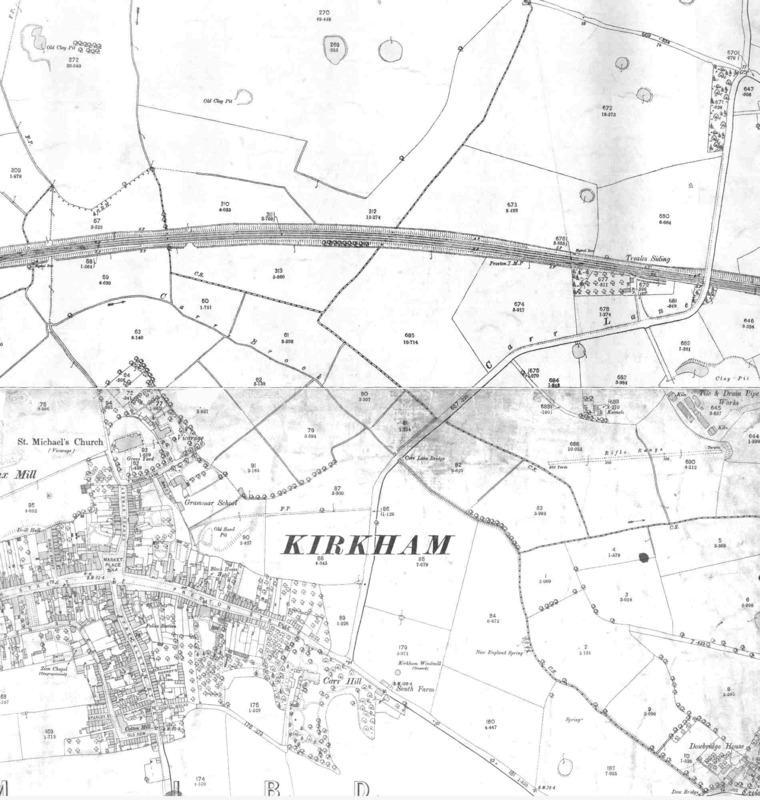 Two maps are provided: the 1769 map on its own and overlaid on the current town plan. 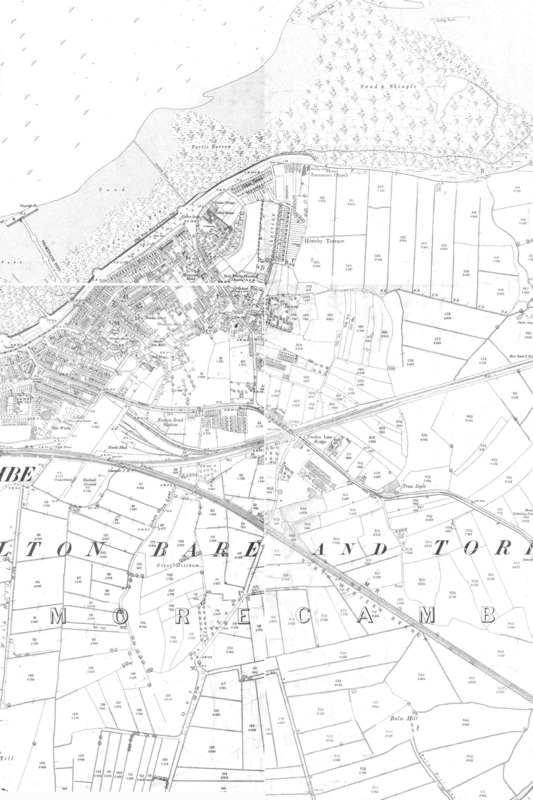 Caton - This Tithe Map of the Caton parish was published 1843. 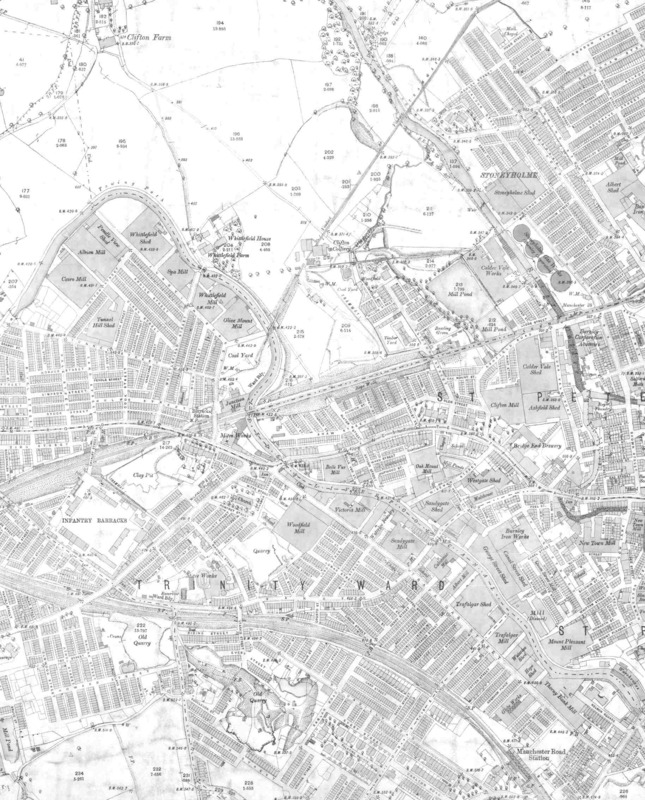 These maps have been scanned at 200dpi and are reproduced here at generally half that resolution. Several of them had to be scanned as greyscale to retain legibility and have had to be published as jpegs with some loss of quality. Printing these maps can be a problem if you only have an A4 printer. You can change the format to landscape and get a bit wider. The alternative is to centre the area you are interested in on the screen, then press the PrtSc (printscreen) key to put it in the clipboard. By opening a package such as Word or Powerpoint, you can then paste in the screen image and print from there. Another method is to right click on the map tile and save it to your computer. You can then open it in Paintshop or similar graphics programme, crop it and print at any scale. WindowsXP/Internet Explorer 6: By default this browser resizes images to fit the screen. To view the maps full size you will need to un-tick the resize images box under:- Tools>Internet Options>Advanced>Multimedia. Copyright: This is complex as both these scans and the base maps are separately subject to copyright! 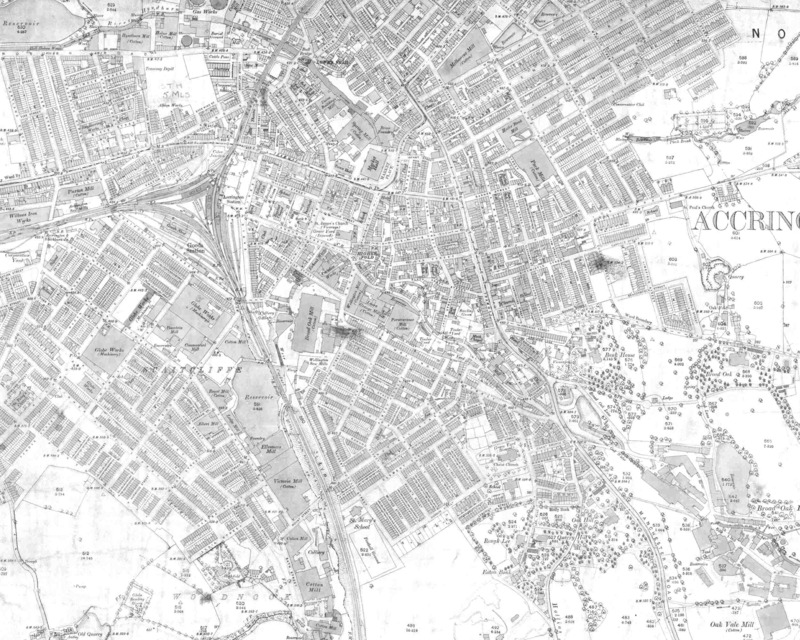 As regards the original paper maps, Crown copyright (eg OS maps) lasts for 50 years, everything else for 70 years. 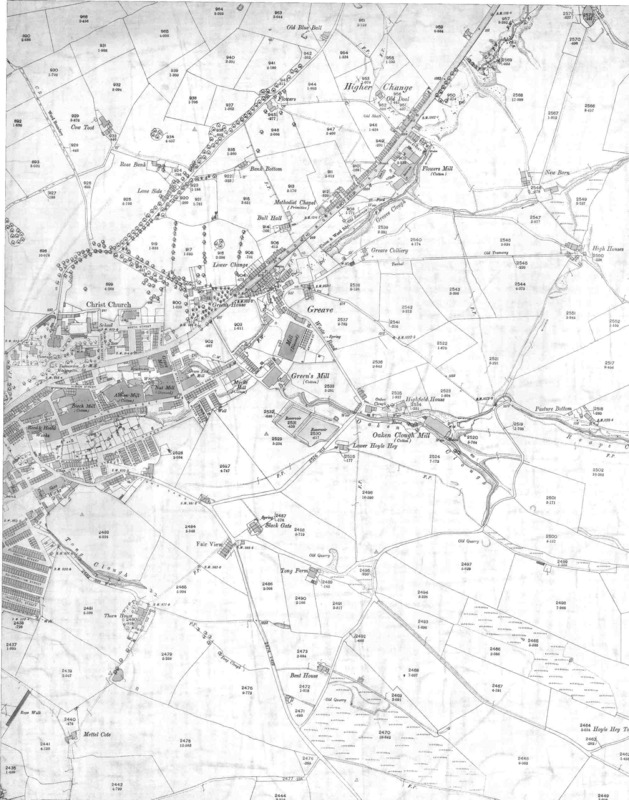 The base maps from which these scans were derived are now (believed to be) out of copyright but these scans are copyright Lancashire County Council. There is no objection to using these maps for personal research but they cannot be reproduced elsewhere. If you need to refer to them then please link to them here and include an acknowledgement to Lancashire County Council. MARIO - Maps And Related Information Online - old maps, aerial photos and much much more! For old maps try the transparent option. Museums - a guide to Lancashire's museums including opening hours. 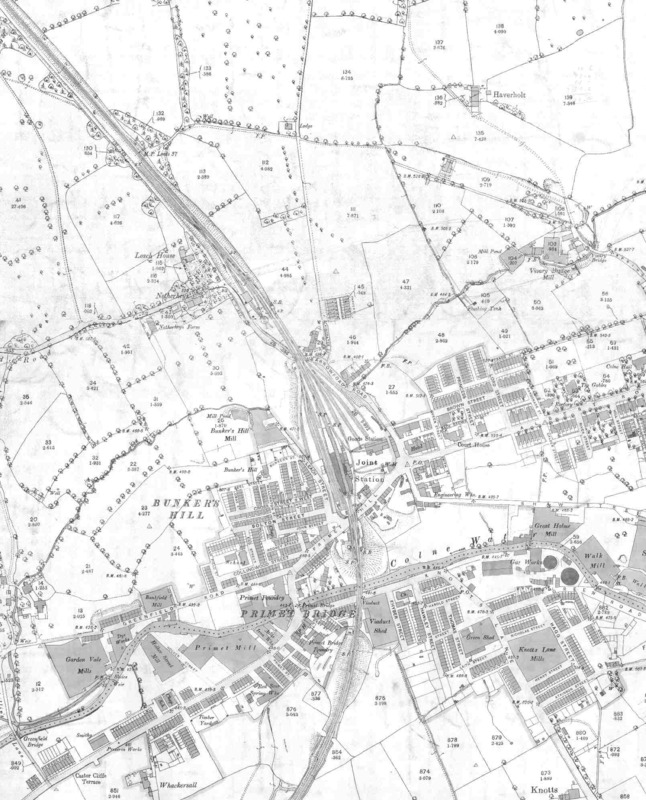 Lancaster University - maps of Lancaster and surrounding area from Lancaster University Library's map collection.